Spring has finally reached us and last Sunday I could spend the first afternoon on the terrace. 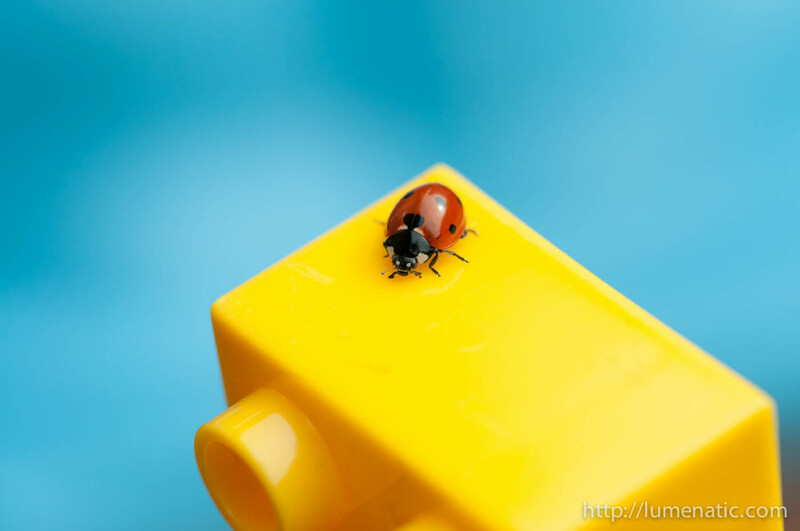 While my daughter was playing with her Duplo bricks a ladybug crawled around. I grabbed my D300s with the 105 mm macro lens and was able to take some shots of this insect. Ladybugs can fly, but they are not very jumpy, meaning you can poke them gently and “guide” them to go this or that way without flying away. So I grabbed a yellow Duplo brick and “offered” it to the ladybug to crawl onto. After several attempts the insect did what I intended it to do and started wandering around on the yellow brick. I placed the brick in front of another large Lego piece (the blue…ish background). From there one has to work quick, since even though the ladybug is not jumpy, it is in constant motion. I had to turn and reposition the brick several times because the insect crawld over the edge. I took about 6-7 shots and this one was the best. Nearly no fixes in post, just a tad of raising the dark parts to bring out the details on the ladybug a little more.